Several tests are used to identify angina. Common tests include an electrocardiogram (ECG), exercise stress test, nuclear stress test, and coronary angiogram. An ECG records the heart’s electrical activity. An ECG may be repeated over several hours. An exercise stress test, also called a cardiac stress test or treadmill test, involves monitoring your ECG and blood pressure while you walk on a treadmill. The exercise stress test provides information about how your heart works with an increased blood flow demand. A chemical or nuclear stress test involves infusing medication in a controlled setting to raise the heart rate in order to determine how well specific areas of the heart are working. There are several different chemicals and different imaging formats that can be used based on the patient’s individual needs. A dye and X-ray are used to show an image of the heart structures with a coronary angiogram. 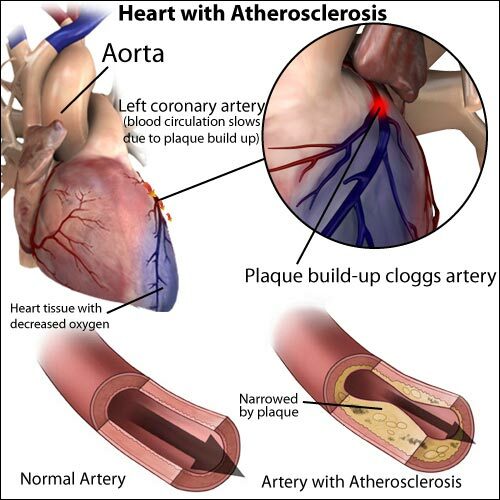 Coronary artery disease caused by atherosclerosis, or hardening of the arteries.